So, you have been using Scratch with your class for a while, and wondering how you can help them move towards learning to code an app? This revolutionary new app for the iPad uses Swift, the programming language for developers to create apps for the iPhone, iPad and Mac. Students use this interactive and fun app to solve puzzles and learn to code along the way. Swift Playgrounds requires no coding knowledge to start, but is a deep app that has the potential to grow students' skills to the point they can move into Xcode, Apple’s developer tool and make their own app. When launching the app, students can begin with ‘Learn to Code 1 & 2’ lessons and then move on to a range of challenges. Each lesson has a number of tasks, which introduce students to commands that they will use to move the character known as ‘Byte’ around a virtual world, achieving things along the way. Swift Playgrounds is a free app, available for iPads running iOS 10, and requires an iPad Air, iPad mini 2 or later. 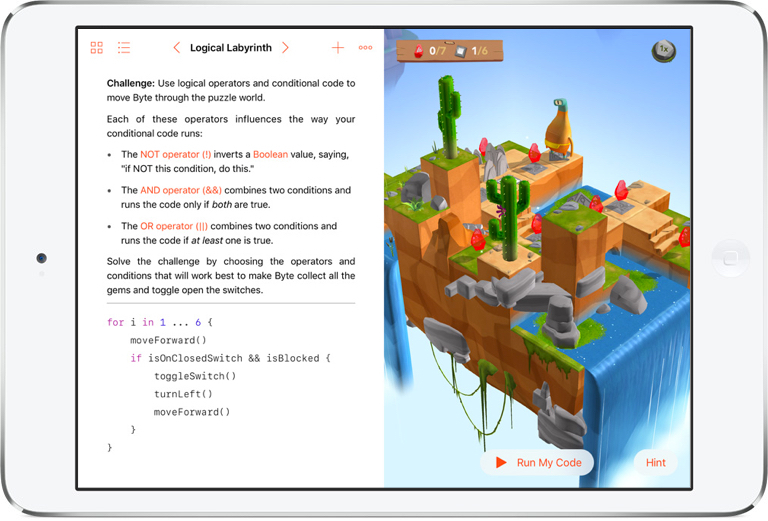 Read more about Swift Playgrounds, and register for the Coding in the Classroom Workshop to explore this app and how to use it in the classroom.